T-Mobile is now bringing a Ceramic Black edition of the HTC One S, just in times for the Holidays, and that’s good news for everyone who loves the slimness, lightness and the convenient for one-handed use dimensions of the device. The black One S goes on sale now via T-Mobile.com and the carrier is bringing in a limited time deal to get the phone for free after a mail-in rebate if you sign a 2-year contract. Overall, the One S right now runs on Android 4.0 ICS, but HTC has promised a Jelly Bean update soon. 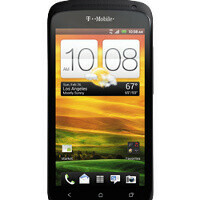 It features a 1.5GHz dual-core Snapdragon S4, and an 8-megapixel camera. Its weakest point seems to be the qHD resolution on the screen, but if you are not a screen perfectionist it should still be fine, especially for that price of free. The display is 4.3 inches and of the AMOLED kind. I think we tried to turn off the apps she doesn't use in the settings, but they're almost always popping up somehow or another. I love this ceramic coating of One S, but I heard it has some chipping off problems and it looks like HTC has corrected it? that was only the first few production problems. fixed within a couple weeks im pretty sure. that's probably why it took so long to get State-side. This is a gorgeous phone. this is a pretty good deal here. i was wanting the ceramic black One S to come to T-Mobile since it launched in the Spring and now since it's here, it's free and is pointed towards the mid-range market anyway i guess i can say better late than never.